Good morning! 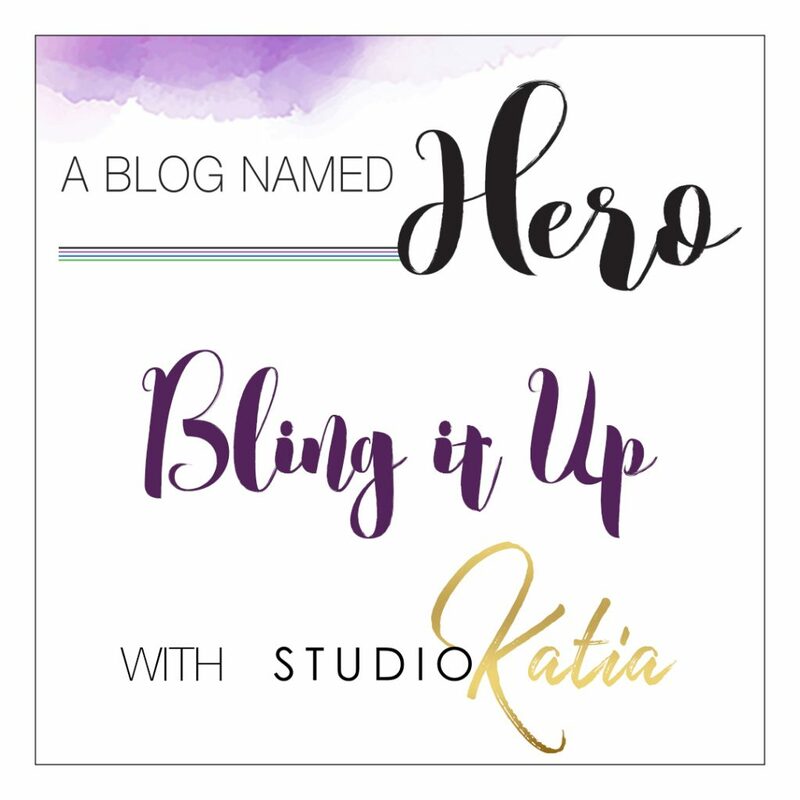 It’s time for a new challenge over at A Blog Named Hero and this month we’re challenging you to Bling It Up and we’re collaborating with the fantastic Studio Katia! 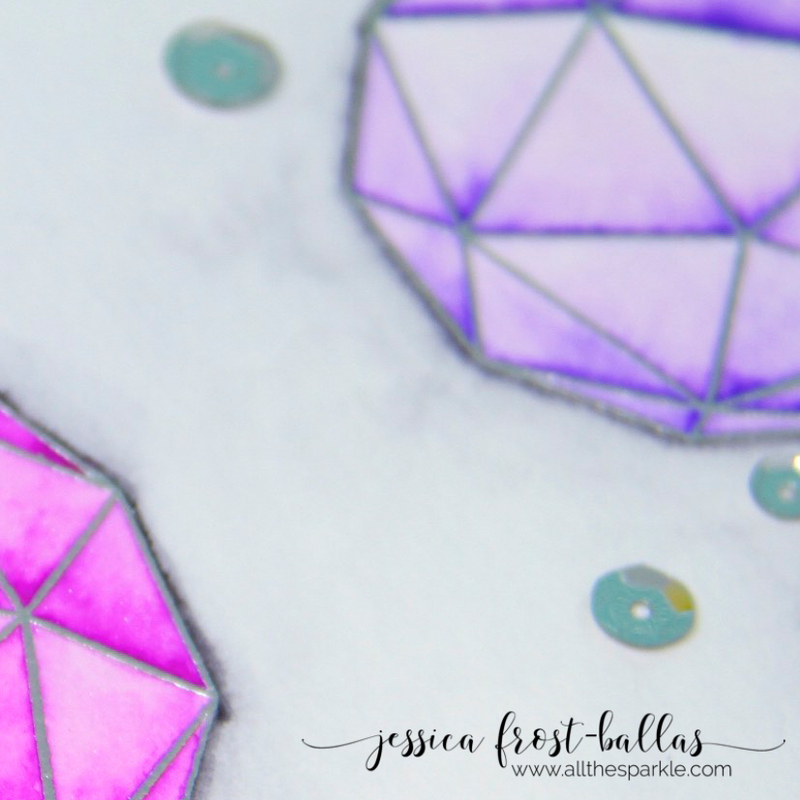 If you’ve visited my blog before you know that anything sparkly is right up my alley! 😉 Katia sent us gorgeous embellishments and I couldn’t wait to use them for this challenge! I’ll have to take a quick close-up video of this card so you can see just how sparkly it is…it’s practically blinding! 😉 To start I stamped the fox from Studio Katia’s Foxes on a piece of white cardstock and a post-it note. I fussy cut the fox from the post-it note and placed it over the other fox to create a mask. Then I stamped the tree trunk under the fox. I colored him with copics and then fussy cut him. Next I blended broken china, faded jeans, and wilted violet distress oxides onto a piece of watercolor paper and spritzed it with water. Then I swiped a perfect medium pad across the card randomly and then brushed on perfect pearls powder. I used a swiffer to wipe off the excess and then spritzed it again with water to set the powder. I stamped the sentiment from Hero Arts Kelly’s Good Night onto black cardstock and heat-embossed it with white embossing powder. 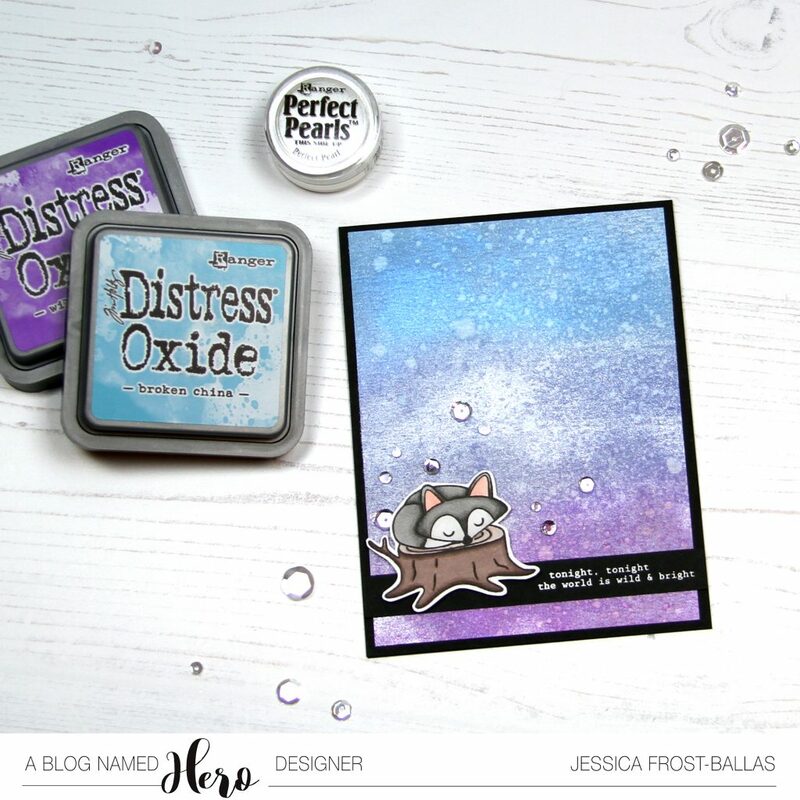 I adhered the distress oxide panel to a black card base and then added the sentiment and my fox. I used foam mounting tape to pop up my fox for a little more dimension. Finally I added a mix of Crystal Clear sequin fusion mix and the Sparkling Crystals embellishments to create sparkling stars in my night sky! 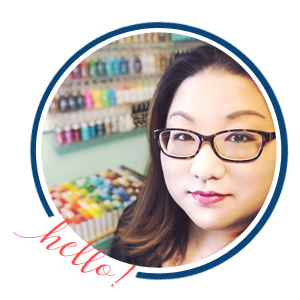 Many thanks to Studio Katia for sponsoring our challenge this month and I can’t wait to see what you create! Head over to A Blog Named Hero to see inspiration from the rest of the design team and more details on the challenge! Thanks so much for visiting and have a wonderful day! It looks awesome, love the background and that fox is so cute ! 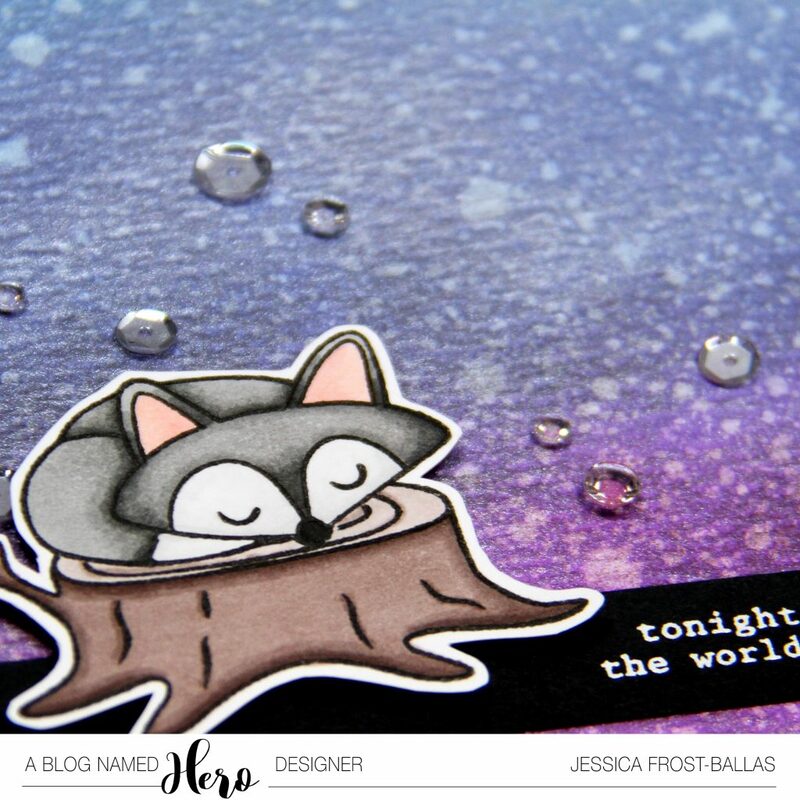 How darling your little fox, napping under the pretty, sparkly sky! Love this! AWESOME card! I love the shimmer you achieved!